Here you'll find all the news about our latest releases: new features, improvement of existing ones and bug fixes. On-site status. 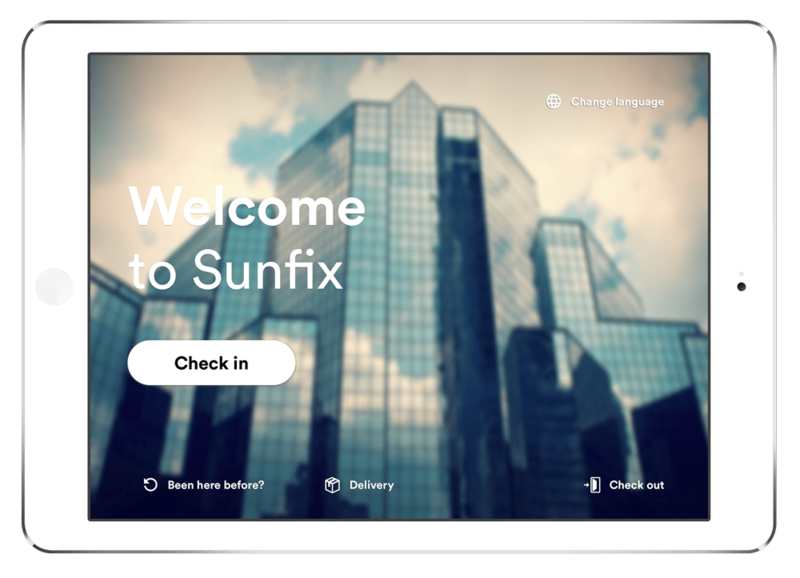 “On-site” is an optional visitor status that sits between “Expected” and “Checked-in,” and allows you to implement an extra step in the entry process for your visitors. This can be useful if you perform added security checks, operate a large campus, or integrate with your access control system. More information on our Help Center. Confidential visitor dropdown. Both your returning or expected visitors can now recognize their profile on the iPad without revealing their full names. 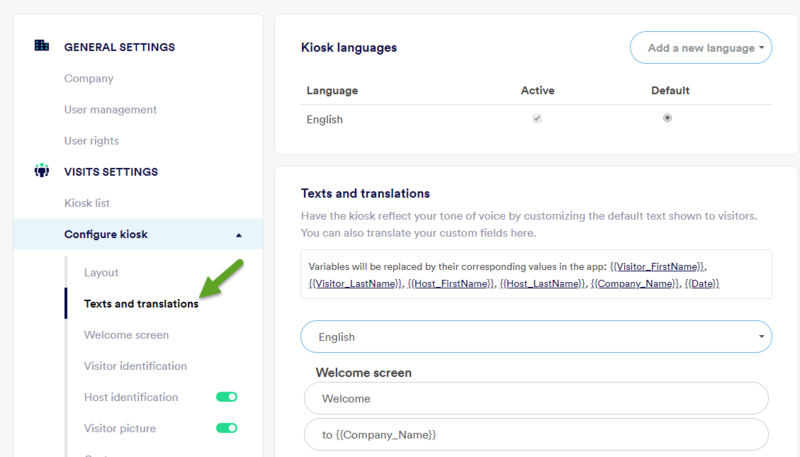 You can activate this setting in Settings > Configure Kiosk > Visitor identification. Google Drive integration. You can now store your signed agreements in Google Drive. Cisco Webex integration. Your hosts can now receive check-in notifications on Cisco Webex. Multi-location user provisioning. Global admins can now automate user provisioning across locations from one central place. Users can be provisioned based on rules that leverage the attributes from your Directory (such as City or Language). User provisioning: additional attributes. 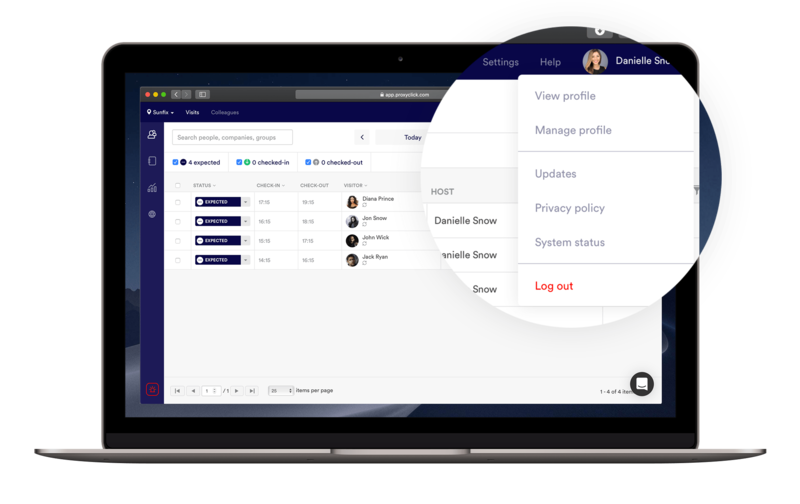 In addition to the user name and email address, you can now also synchronize the user mobile number, direct phone, function, and language. Custom fields in agreements. You can now add custom fields in the signed agreement. This is useful if you need to include any information the visitor just entered (e.g., passport number). Redesign of agreement settings. Your agreement is now listed in a table format for a better overview. 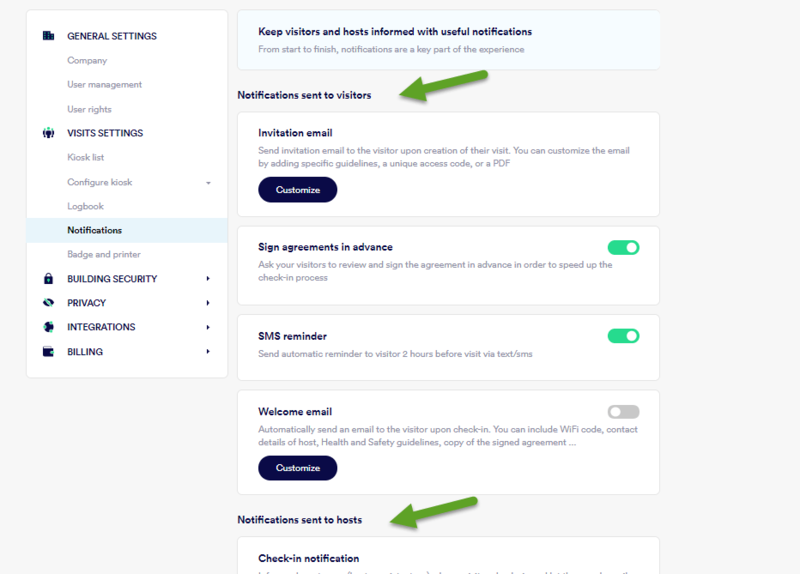 Edition and configuration of an agreement are now on two separate pages for clarity and ease of use. Shorter process to sign agreement in advance. 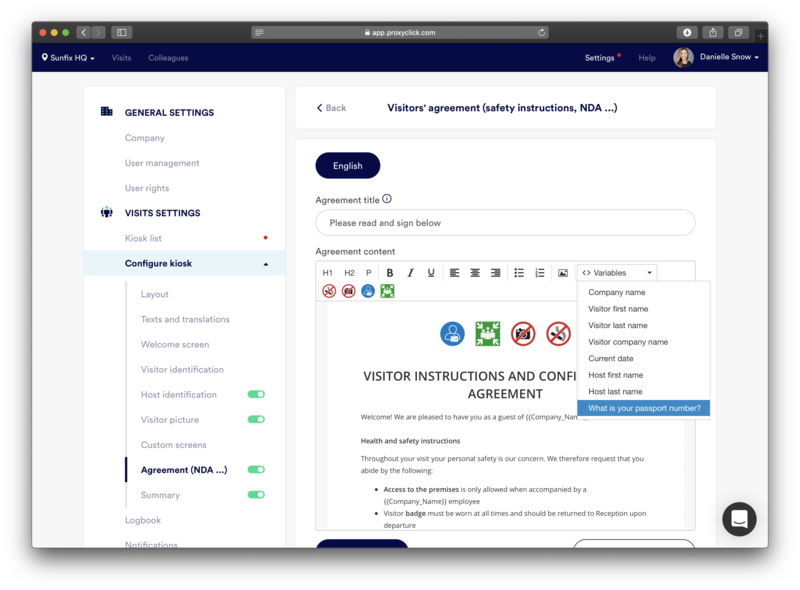 The process that visitors go through in signing agreements in advance has been shortened to encourage your visitors to take advantage of this feature, and reduce check-in time in the lobby. Location overview. Clicking on a location from the location overview will open it in a separate window so you can work in both windows in parallel. Some users received a copy of the email when they clicked on reply buttons such as “I’ll be there in 5 minutes”. This has been fixed. Pictures of visitors were not correctly cropped when printed from Dashboard. This has been fixed. Integrations. 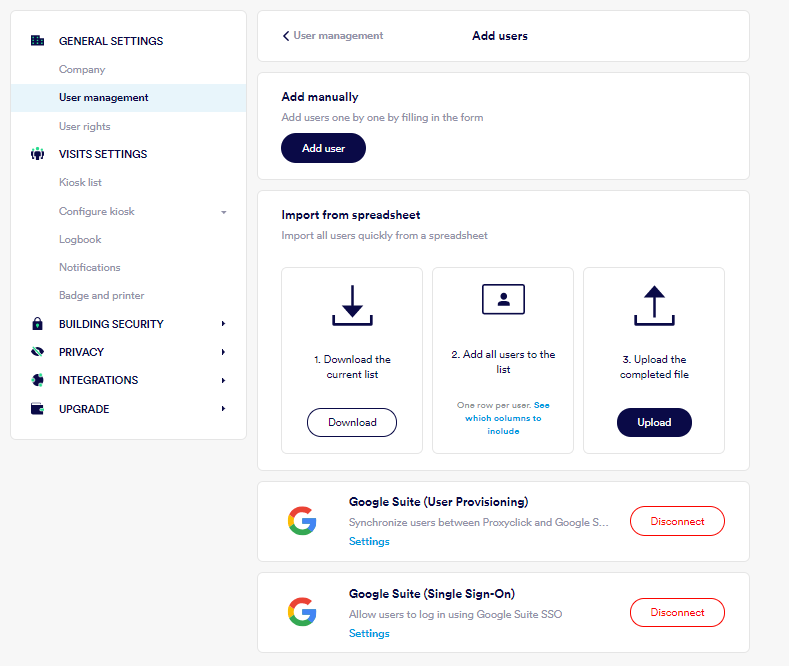 Proxyclick now officially supports SSO and User Provisioning for Google Suite. Visit the Marketplace to initiate the integrations. Integrations - User Provisioning (LDAP). In the LDAP settings page, we now display the status of the integration (last sync, etc.) to give you more control and knowledge about your LDAP status. Security email. Admins can now be alerted when a user with future visits gets deleted. The admin can then decide what to do with the visits (i.e., re-assign them, delete them, etc.). Admins can activate this alert in their profile. iPad. The secondary buttons (delivery, languages, check-out) can now be made more visible by applying a border around them. This setting can be found in Settings > Visits > Configure Kiosk > Layout. Quality check for groups. Visitors from Excel uploads are now checked against the address book to avoid duplicates. This was previously only applied to visitors entered manually. Settings > Notifications. Notifications are now clearly grouped as visitor notifications vs. host notifications for more clarity. Settings > Text and translations. We’ve moved the iPad text editing and translating functions to the left sidebar to make it more accessible. Setting > User Management > Add users. When SSO or User Provisioning is activated, the corresponding integrations are now displayed at the bottom. Skype for Business. The Skype for Business integration requires a periodic refresh of the authentication token. An automatic email has been added to remind admins to refresh token. Long emergency lists were not printing correctly in IE 11. This has been fixed. The print check box was always displayed in the visitor group form, even when no printer had been connected to Proxyclick by the user. This has been fixed. App now supports the resolution of the latest iPad Pro version. Custom fields reverted back to default value in specific cases. This has been fixed. External watch list. You can now screen visitors against external lists (e.g. export-related, law enforcement-related, or sanction programs-related denied persons lists). Internal watch list. You can now adjust the number of false positives by choosing between 2 matching methods (standard vs. narrow), see new help article. Mandatory pictures. You can now make pictures mandatory at every visit, even for returning visitors. 2-Letter Name Recognition. It is now possible to be recognized during your iPad check-in based on typing 2 letters instead of the standard 3 (e.g. locations in China). Please ask support to change that setting for you (Enterprise plan). Logbook. 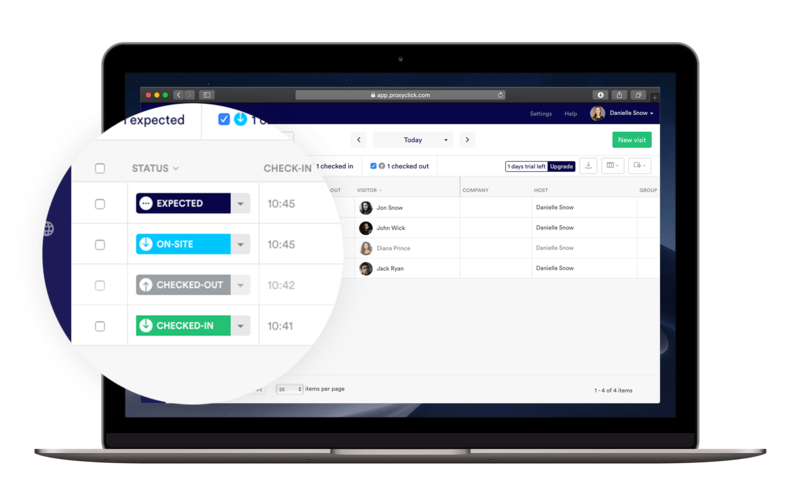 The number of visitors per group is now shown in the filter, thereby helping receptionists to better anticipate their day. Settings. 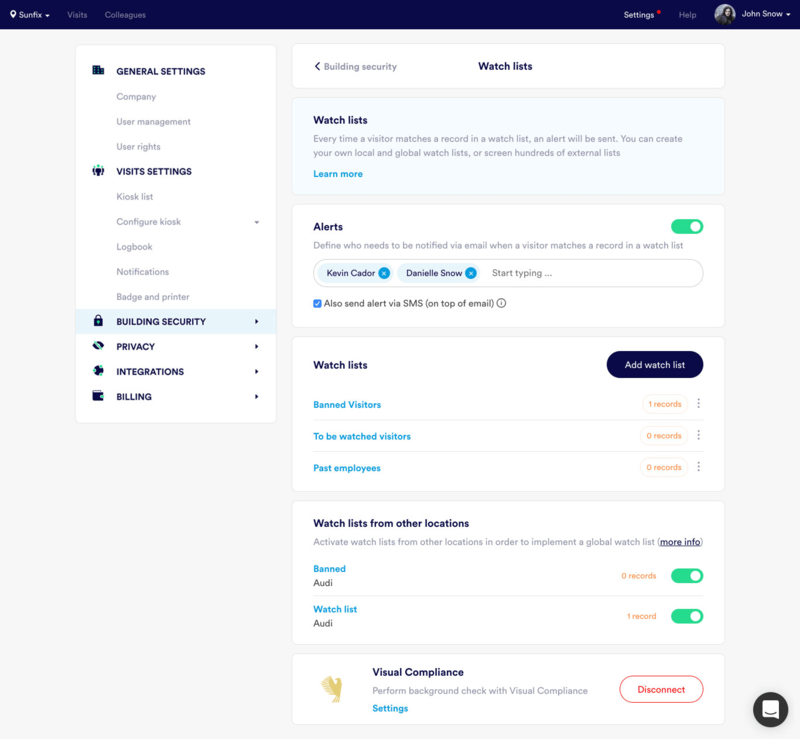 We redesigned the watch list pages (e.g. settings, new watch list, new record, global watch list selection, edit pages) to make them easier to manage. Settings. We introduced individual settings pages for SSO and User Provisioning integrations. Now you’ll only see the parameters required by your Identity provider. We also use the specific terminology of the different providers. 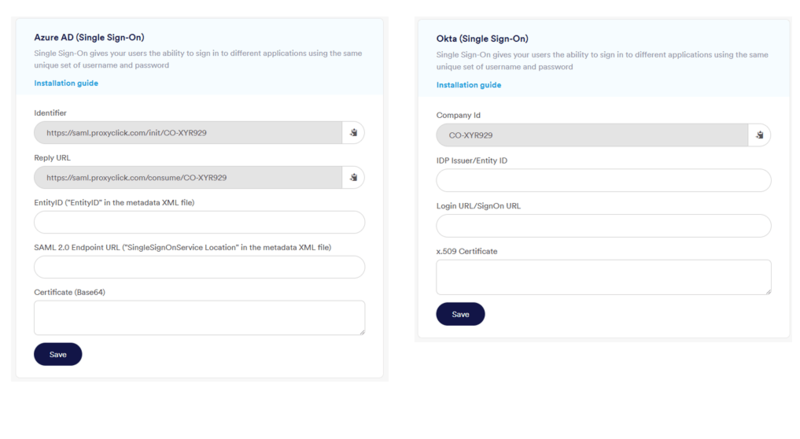 This makes installation and configuration easier (shown below: differences between Azure AD and Okta settings for SSO). Settings. The settings menu is now "floating," meaning you’ll see it even when you scroll to the end of the page. Some Agreements (NDAs) were not uploaded to Box. This has been fixed. All agreements were queued so none should be lost. Bulk upload of users was failing if language was in uppercase. Language can now be in both lower or uppercase. Exports were not showing the right status when the start date had been changed (very rare occurrence). This has been fixed. Exports. Visit date was sometimes merged into location column (for recurring visits). This visual bug has been fixed. The comments (eg "I’ll be there in 5 minutes") were in some cases only showing after a refresh (instead of real-time). This has been fixed. A first name - last name switch has been introduced to allow visitors to easily correct a wrong entry. Lighter and clearer icons have been introduced on the welcome screen. In order to increase check-in speed, a timer has been added on the check-in button in the summary screen. 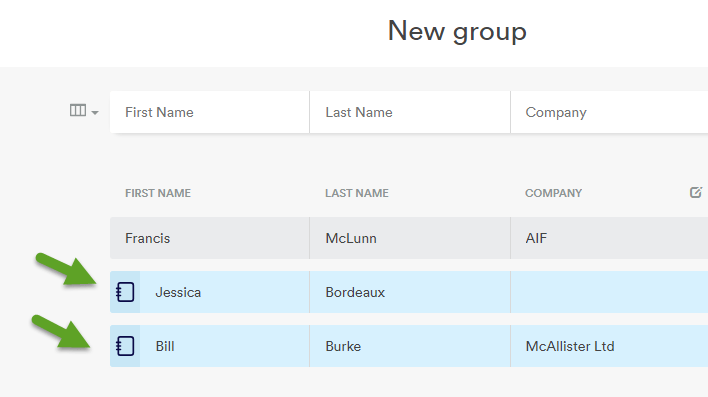 If prefilled, custom fields now show the selected value at the top (faster check-in). 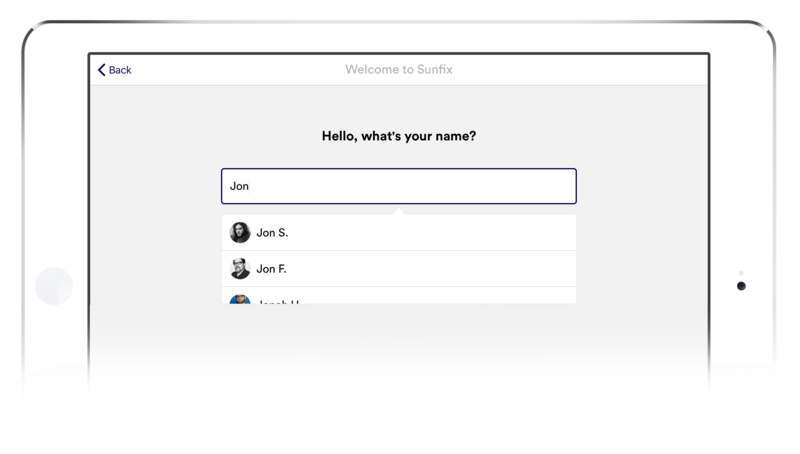 Optional fields are indicated as such on visitor fields screen. Parsing of names has been improved: middle name is now added to first name instead of being ignored. Summary screen was not correctly updated in case of an edit. This visual bug has been fixed. End date on badge (if selected) was not always correct. This has been fixed. 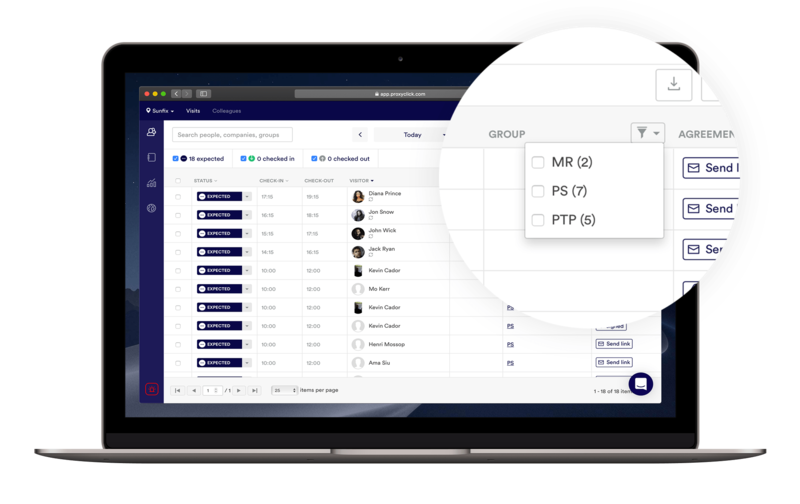 Hosts can now add “meeting@proxyclick” to an existing meeting, not only to new ones. We replaced the generic error message ‘“there was an error” with more helpful error messages (e.g. “We could not create the visit because it is in the past. Please create a visit in the future”). Improvements are both for Outlook add-in and generic integrations. This release contains the Beta version of ID Match (see Help Article here). It also fixes a bug that prevented the NDA from displaying in some cases (dropdown conditions). 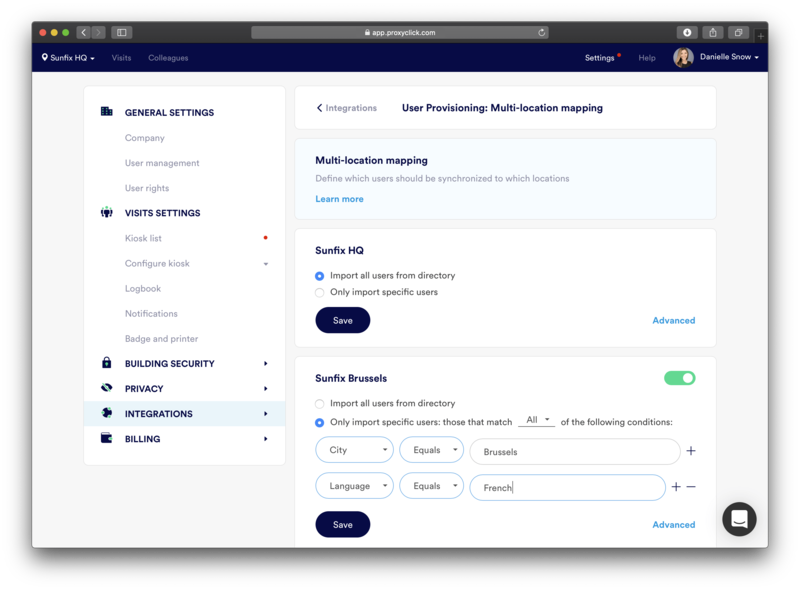 Redesigned multi-tenant screen for better usability and aesthetics. Specific layout for 2, 3, 4, 5 logos (centered); larger font when there is no logo (better readability); nicer boxes for tenants (more padding between boxes, rounded angles). Improvement of the mobile phone capture screen. Clearer screen and larger font. 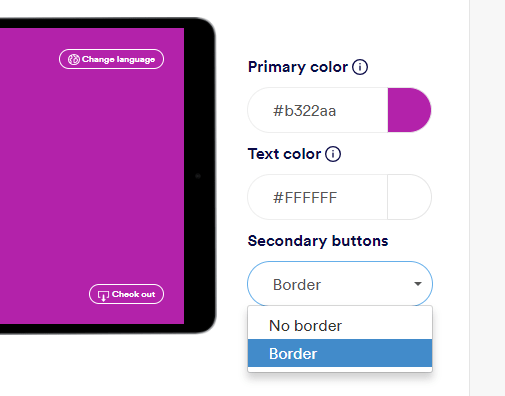 Custom fields that were not displayed on the iPad, but were still used in badge or agreements conditions, were not updated correctly in specific scenarios. This has been fixed. New hosts added on Dashboard were not always updating real-time on the iPad. This has been fixed. Check-out time on Badge when printing from iPad was always set to 1 hour after check-in. This has been fixed.